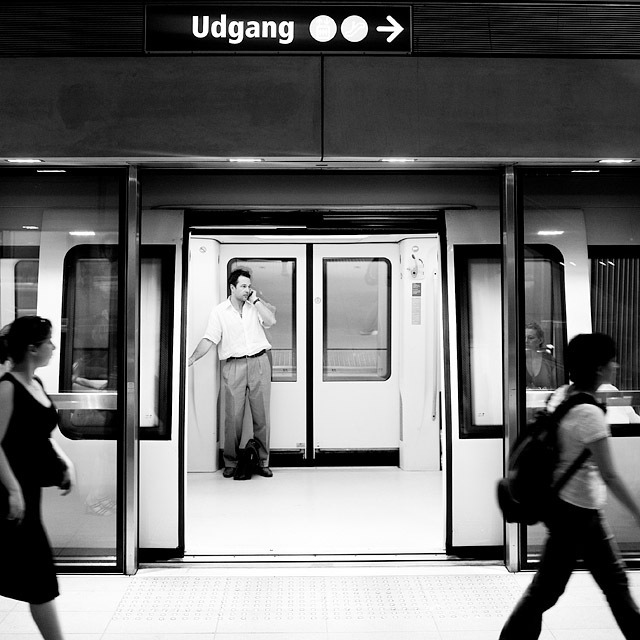 Shot at the Copenhagen Metrostation "Frederiksberg". Thank you for your votes and kind comments! Total realism captured with that photojournalism edge. Congratulations on your 5th place finish. Nej hvor dejligt! Jeg er ikke den eneste dansker på denne side. Mange gange tillykke med din fine placering. Jeg har godt nok ikke selv rigtig deltaget med nogle billeder endnu, men det skal nok komme, nu hvor jeg har købt mit første DSLR. I like everything about this image. Just perfect capture. Congrats! Congrats on fifth buddy! Awesome! Congratulations on your top 5. Very good shot! I like this picture for some reason..?? I like the tone of it and the people all doing their own thing. Great capture. Great job. Congratulations on such a great score!! 8 - Very good. B&w works well with the simplicity. The only thing, and is 'nit-picking', is main subject/'interesting factor', if that makes sense. As is, very 'day to day', which may well be your intention, but if (and obviously opportune), to capture more 'character', make this even better in my opinion. Like the big size/square crop. Up to 8 from 7. Awesome contrast - has a really alive feeling to it. The woman on the tright in the background is a neat discover too. fave. Very good. It's probably Danish or something. I love the contrast and the composition. It catches my eye immediately. I think you'll place high with that one. I like it. Excellent B&W. nice!! feels like it's telling some sort of story -- great shot!! The framing is great, but the whites seem blown out. Nice conversion. I like the motion implied on the people outside. well done...you managed to put his head inside 4 different frames. great job. I love the lighting, love the mood. I hope this does well. I'll give you a 9 to start you off. Great! Who'd have thunk you could use people as part of a frame? Not that it affects the score, but something to think about: A vertical picture of more than about 520 pixels tall won't fit many monitors. I had to scroll this picture to see all of it, meaning I don't see it as a whole. It is as if you had cropped out the sign. Excellent B&W and street shot. 10. Nice sense of depth to the image, like the motion in the walking foreground people against the stillness of the passenger. Great framing, love the composition and feel in this photo. I'm giving you a ten! and hope you do well Thomas! Proudly hosted by Sargasso Networks. Current Server Time: 04/22/2019 08:14:18 PM EDT.